Someone posted this article on my Facebook page as a “educational” tool. I felt so badly for all the dogs involved I was compelled to debunk this once and for all. For most of my adult life I have had to listen to supposed experts expounding upon the dangers of shaving the coats of our dogs. In the 1960’s and 1970’s it was widely accepted by groomers (except for a few like me) that if you removed the hair from in front of the eyes of an Old English Sheepdog or Shih Tzu or Yorkie, etc., the dog would go blind. So many groomers refused to do this simple act. They would even become angry at the dog’s owners if they requested the removal of the hair in front of their dogs eyes. Ever try to SEE through a clump of solid hair? Never mind the tearing, staining and mattering from the irritation of hair constantly banging into your eyes. Not to mention the eye infections and corneal abrasions from the dog bating at its poor assaulted eyes. Before and into the 1970’s it was sacrilegious to cut ANY long coated breeds like Afghans, Old English Sheep Dogs, Yorkies, Lhasas, and the like, short for any reason. The conscientious groomer was supposed to subject the dog to hours upon hours of torturous de-tanglinging, pulling and brushing in order to keep a worthless coat on a dog who was miserable because if it. I developed “puppy cuts in the late 1960’s much to the gasps of my peers who said I would destroy the coats of these dogs. Well what about the lives of these dogs??? So let’s review each of the points of this article simply and with a bit of common sense, shall we? There is one issue that I am very passionate about, and if you learn nothing else from this blog, I hope this sticks with you: There is no reason to shave a double coated dog. Why? Let’s break it down. Myth: First, some basic information, so we all start out on the same page. A double coated dog is any dog with a harsh outer coat and a soft undercoat. The soft undercoat is what sheds and leaves tumbleweeds all over your house. German Shepherd Dogs, Golden Retrievers, Labrador Retrievers, Australian Shepherds, and Siberian Huskies are just a few examples of a double coated dog. (Shih Tzus, Maltese, and Yorkshire Terriers are NOT examples of double coated dogs. This information does not apply to them.) These two coats grow independently of one another and to different lengths. The outer coat is longer, and tends to grow slower. The undercoat is shorter and grows faster, and also turns over, or sheds, twice a year. 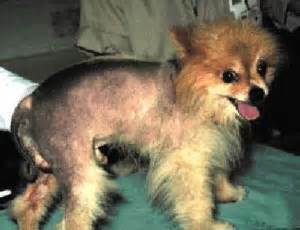 Now that we all understand basically what we’re dealing with, why shouldn’t you shave a dog like this? Most dogs who are kibble fed, assaulted with spot on pesticides, over vaccinated or otherwise stressed in their everyday lives have never experienced the “twice a year” shed and shed all year long. Any dog under stress, long coated, double coated or short coated, will shed constantly until that stress is addressed and relieved. Myth: Dogs with double coats have sensitive skin. This means that your shaved dog is likely to come home with razor burn, irritated skin, and is much more likely to be sunburned. The skin of these dogs is more sensitive, because the thick hair protects it from the sun, bug bites, and anything else that your dog encounters during a hike, a romp in the backyard, or a roll on the carpet. These dogs can end up with hot spots, lick excessively, and are generally miserable. No one wants that for their dog. Look at the color of the dog’s face and the dog’s body. His skin is pink and is going to easily become sunburned and irritated. There is nothing, I repeat, nothing wrong with this shave on this dog. Actually it is a beautiful job, executed by a groomer who actually knows how to use his or her equipment without causing any of the forebodings mentioned above. The dog has been bathed and properly dried. I will agree that he needs his time limited in the hot summer sun for a few days (actually the time in the high summer sun for all dogs should be limited) but his coat will grow back quickly and thickly in no time. If the dog is razor or brush burned it is because of the groomers lack of skill, patience and knowledge of the proper use of his or her equipment. I would like you to note the tail is not shaved. This will be significant when we get to number 3 of this article. 2- Myth: It does NOT make them shed less. Double coated dogs shed twice a year, and that is under coat. The rest of the time, the shedding is normal hair turn over, and that is seen in all animals with hair (including you, your poodle, your Aunt Sally, and the squirrel in your backyard). Shaving them does not prevent this from happening. It makes the pieces smaller, and damages the coat in the process. Instead of having your dog shaved to get rid of unwanted hair, having the dog professionally groomed on a schedule will remove all the dead undercoat, leaving only healthy coat and stopping those tumbleweeds from rolling across your floor. 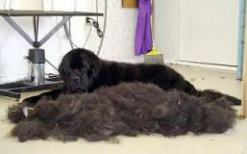 Look at all the dead undercoat removed from this Newfie. His coat is shiny and beautiful. No it does not stop the twice a year or “constant” shedding but it does make it much more manageable. The owner is now able to brush and comb a manageable coat length and bathe their own dog, if they choose, without a big mess. And the Newfoundland in the photo above has taken a LONG time to produce this much shed undercoat. Is that humane? How many hours did it take to remove all that coat and what was the condition of his skin from hours and hours of raking and tugging? I have seen dogs horribly burned from the overzealous raking of undercoat. There is more skill involved in this procedure than in shaving. It is more likely your dog will enjoy having his coat removed with a clipper more than with a rake once it gets to this condition. Now don’t get me wrong, I do believe that if you cannot maintain the coat of your dog then regularly scheduled grooming with “professionals” is a huge part of your responsibility in owning and loving your dog. However, it is up to you to determine how that is best done within the parameters of sanity, comfort and budget for both you and your dog. Myth: It permanently damages the condition of the coat. The under coat, as I said before, is short and dense, while the outer coat is longer, glossy, and harder hair. 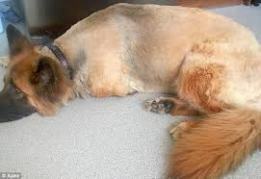 The undercoat is all that is left when you shave a dog, and as it grows faster than the outer coat, it takes a very long time for the outer coat to catch up, if at all. This means that there is no outer coat to protect the under coat, which becomes brittle and breaks off, and that there is no shiny, glossy hair on your dog. On some dogs, the under coat never grows back properly, leaving the dog’s coat sparse and just plain ugly. It also damages the cycle of the hair, making the shedding times unpredictable and in some cases, never end. It can also mean that you’re stuck shaving the dog for the rest of his life. All three of these dogs have coats that look dirty, unkempt, and in no way pleasing to the eye. All of these dogs have had their coats ruined by shaving them. This is one of the BIGGEST myths of all and the misuse of photos of dogs afflicted with a thyroid disorder (which has nothing to do with shaving and everything to do with a serious medical condition) is upsetting if not dishonest. Remember the golden in the first photo? Was his tail shaved? They rarely are yet somehow the tails of all these dogs are “injured”? Compare them to dogs with chronic thyroid disorders below. 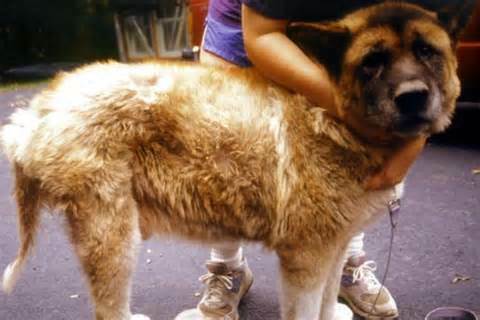 Dogs with alopecia hypothyroidism experience an average of 40% hair lost with the characteristic “rat tail”. These damaged coats have nothing to do with being shaved. Since all coats start inside the body of the dog you can only be permanently altered from the follicle. 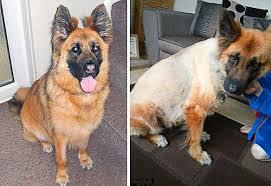 Cuts, abrasions even burns heal in the normal dog and after the coarse scar hair heals the dogs coat returns to normal. Myth: With so many breeds to choose from, it’s easy to find a coat you like. If you don’t like the hair of a Collie, go for a Smooth Collie. If you don’t want a dog with as much hair as a Golden Retriever, maybe a Boxer will be more your style. The hair of a dog serves a purpose, and is part of the package. A little bit of research goes a long way. This seems to me, the most disheartening of all. Many of us have no idea what breed of dog is going to claim our hearts until it happens. If you fall in love with a collie in desperate need of rescue should you take a pass and possibly let the dog die because the coat is not what you really what you were expecting? Or should you make the best of the new situation by keeping his coat short and manageable, thus giving him a loving forever home and yourself a great dog? 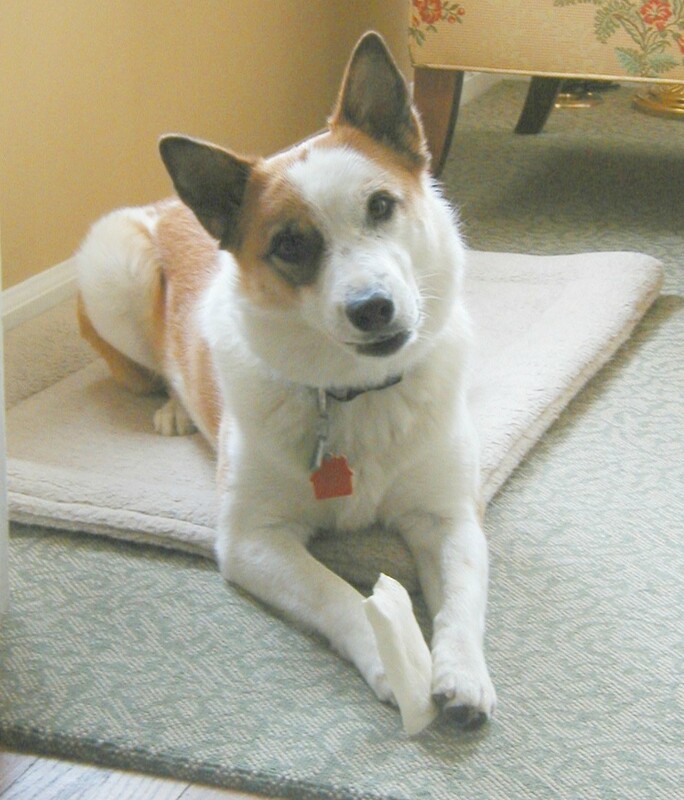 I rescued a Stumpy Tailed Cattle dog 12 years ago. She was 2 and had been in 6 homes that we knew of and more shelters than that. She had 6 sets of full vaccinations in her short 2 years because of going from shelter to shelter and was a bit of a mess when she came to live with us. She had a “double” cattle dog coat (more like a corgis) and suffered horribly in the heat of summer. Instead of being outside, which she loved, she hung out in the dark, lonely basement where it was cool. I shaved her as I have thousands of dogs over the decades and she was reborn: Outside most of the time hunting, sunning, chewing a bone, rolling in the grass and just enjoying the weather of all seasons. She has been shaved at least once a year (sometimes twice in clement winters) for the 12 years she has been with us. She was diagnosed with malignant cancer over 1 ½ years ago and given 5-6 months to live. 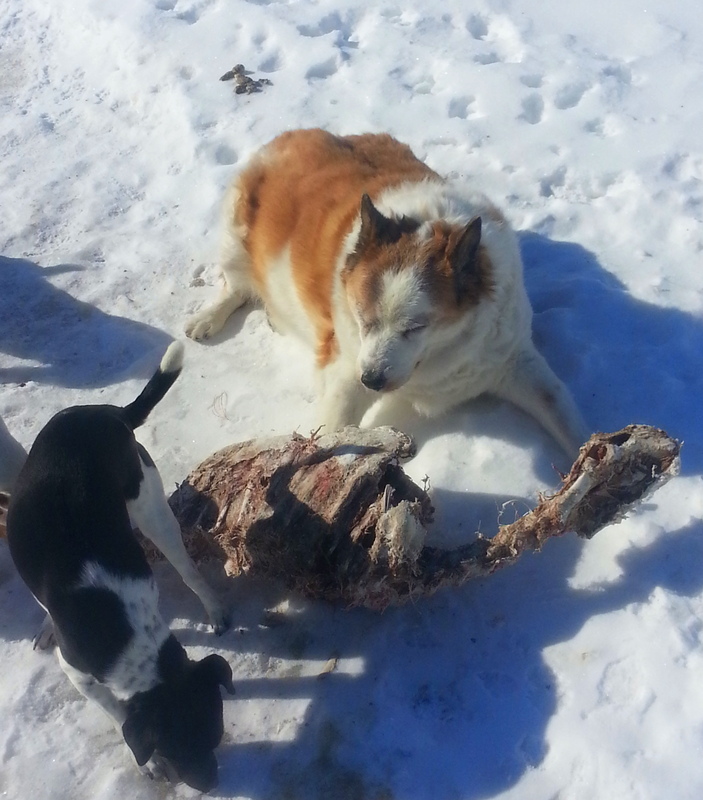 She has huge tumors over her entire body and suffers even more with the heat. So we continue to shave her, which she loves. 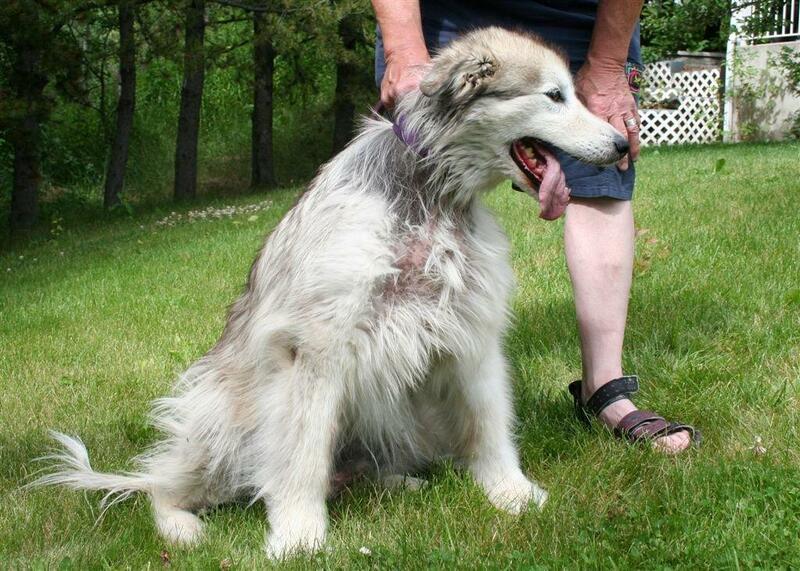 1 ½ years after her dire diagnosis she is still here and still growing coat.
. Myth: The undercoat provides insulation in the winter and cools the dog in the summer. If your dog has a well groomed coat, with no dead undercoat, the coat keeps the dog warm in the winter by providing insulation and keeping the dog’s skin dry. In the summer, it provides a sort of air conditioning system to the dog, keeping him cool. Yes, this does mean he needs to be groomed, it just means that he doesn’t need to be shaved. He’s not going to be hot with all that coat, it’s actually keeping him cool and protected. As long as he isn’t shaved or severely matted, his coat will do it’s job and keep his temperature regulated. This one just baffles me. What Nordic, Alpine or cold climate dogs possess coats that insulate them from the heat?? I have a friend whose Newfie (who is IMPECCABLY groomed at all times) “acts” in commercials. He is sweet, smart and in demand. In his contract it stipulates that any work NOT done in winter will call for an air conditioned room, trailer or dog house to be available to him at all times. He may only work outside in warm weather for no more than 5 minutes at a time before he HAS to go to his air conditioned room. This is because all this coat you are seeing in this article has nothing to do with Nature and everything to do with selective human breeding. We Americans are hung up on an unnatural amount of hair on our poor dogs for some reason. The dogs that we have today are NOT the dogs who did their jobs before they were turned into “show” specimens. A Border Collie BC (before coat). His coat is short (as it should be for work). Even so, he still has to be careful not to overheat when working in the summer sun. 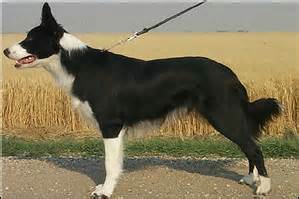 A show Border Collie AC (after Coat). This is a man-made coat. Insulation from the heat? Really??? Myth: See the lighter coat in the center? That’s the undercoat. It is healthy and will do well to insulate this Sheltie from heat and cold. If it didn’t involve the possible death of this Sheltie I would really like the author to test that theory. Or perhaps we could just cloak the author in this same length and thickness of BLACK coat and put her in the August sun to see how she fares? 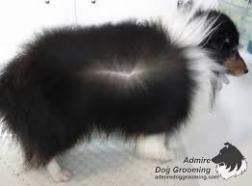 This is what a Sheltie looked like before we started breeding longer hair and more density into their coats. Nature had very little to do with longer, thicker coats and shaving was not an issue. Myth: It just plain looks bad. The under coat is dull and dense and not visually appealing. A dog in a full, beautiful flowing coat is much more attractive. You’re going to spend the same amount of money and I’m going to spend the same amount of effort, so wouldn’t you rather your dog look good? It’s also going to make you stand out as a dog owner who isn’t doing their research and doing the best thing for their dog. No one wants to be that guy. The dog looks much better with his coat intact. No one can tell me that he looks improved with his coat gone. The author seems more invested in her own sense of esthetics than in how the DOG feels. I have shaved thousands of dogs in my 49 years and counting, career. Many who loved the summers but were miserable with the heat. Chows, Malamutes, Huskies, Saints, Newfies, Sammies. Eskies, Akitas, Peres, Cattle dogs, and on and on. Their first reactions after being shaved and bathed was to do crazy, happy zoomies around the grooming shop like little puppies. They are smiling, rolling, dancing and jumping around with the pure joy of being released from their hair prisons. Clients would laugh and ask if I dipped their dogs into the fountain of youth. And I’ll tell you the truth. I wouldn’t have minded if their coats came back a little less thick or long because the next shave would have been easier. But that never happened. So what! : It is never to breed standard. I know pet owners are fond of saying “Oh, I don’t want a show dog!” and I plan to cover that topic all on it’s own in the future, but the breed standard exists for a reason. Be proud of your dog and his glorious coat, and how educated you are on why he needs that coat. I would have liked to have left it out all together because it is so embarrassing but it is part of the article of which I am answering. Myth: It increases the amount of allergens on the dog’s skin. 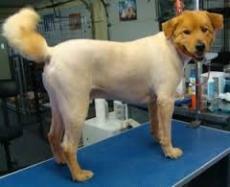 I have heard people say that they shave their dog because they are allergic. That just doesn’t make good sense. The dander of the dog is what you’re allergic to, and having it right on the surface is not going to help your allergies. Having the dog groomed will keep up with the dander and the loose dead hair, and that will help. 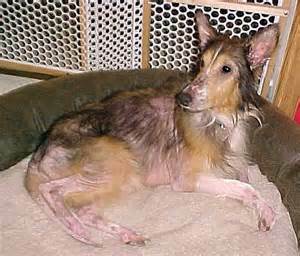 This dog looks patchy and flaky, and not only will continue to shed big clumps, but will release allergens. No, no it doesn’t “increase” allergens i.e. dander. Feeding kibble and commercial dog food increases dander. Stress and over shampooing increases the dander. Immune system assault increases dander. Shaving the dog just helps the owners have a shorter coat to brush and care for so the dander (which is what causes the reactions) can be managed in a timely fashion. Many people who have severe reactions to dog dander find that just switching the dog over to a prey model diet greatly decreases or ceases the reactions they have to their dogs. Keeping the coat brushed and clean more often is always more easily achieved if there is LESS of it for the owner or groomer to deal with. So am I against long, flowing coats on dogs? Of course not. Since I was involved in the AKC show ring for almost 25 years and groomed more than my share of “show” coats, I have a great appreciation of properly and consistently cared for and maintained dog coats, they are beautiful. Do these dogs need these lush, thick, flowing coats? Absolutely not. Nature bears that out in every animal she, herself creates. When we made the decision to “produce” unnatural coats in our dogs, we then took on the responsibility to assure that this human foible would not cause the loss of health, life or happiness of the dogs we have imposed them upon. If you are able to brush, comb and attend to these coats yourself, great. If you can find a groomer who understands how to keep these coats healthy and beautiful without stressing your dogs, even better. If you can do all these things consistently that’s the best. However, in this imperfect world we imperfect humans are not always lucky enough to match the coat type we desire (or to the preferences of some groomers) to the dog that steals our hearts And many average humans don’t understand the dynamics of keeping thick flowing coats in good order and would much rather devote that time (and often expense) to enjoying their time with their best friends instead of being a slave to the brush. So find a groomer who understands this and has the best interest of you and your DOG, over his or her own, at heart and see if you can work together so everyone can enjoy their days in the sun. I keep looking for pictures of dogs (double coated) with their shaved fur grown back because my pup (a gsd husky mix) was so matted when we met that I simply had to shave him (And by I, I mean a prof. groomer.) He actually looked really great shaved, and I think he felt great too. The woman who shaved him didn’t go too close, didn’t cut him and was so gentle and patient with him. But anyway, I’ve been worried as winter approaches from all these websites telling me to NEVER shave my dog. I was given flack in a forum for doing so also. 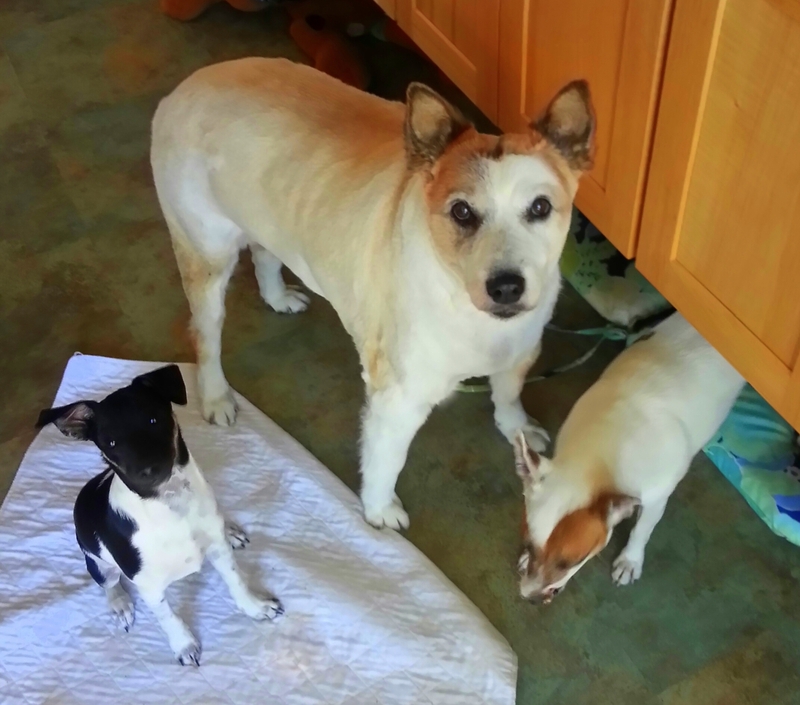 I was astounded… if she had actually read what I had written, why would you spend hours trying to detangle matted fur on a dog who had never been in a car, let alone a groomer, when he could simply be shaved and shampooed and sent home? It took hours anyway! I can’t imagine if they had tried to work through his dreadlocks. Anyway, I was glad to come across your article, sometimes you have to shave the dog and maybe that’s not such a bad thing! Good for you Lisa, you were correct about him being happy to get out of his matted prison. Really appreciate your groomer because she knows her stuff and is gentle to boot. She is a real treasure. Your dog is lucky to have you and I would love to see a photo of him when his coat is regrown. My fluffy beautiful dog love of my life was shaved by a groomer today. It was a huge and devastating mistake but I can’t go back in time and change anything that led up to this groomer’s mistake. 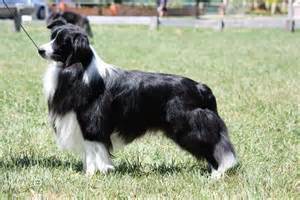 He is a collie lab. The fur is maybe a 1/2 inch everywhere, not to his skin. He was so incredibly beautiful and fluffy and elegant. Will his fur grow back? It was not a mistake unless the dog was physically injured. Did you read the article? Please reread the article and know that you cannot change how or why a coat grows by cutting it off. If that were so we could never have our heads shaved for fear of our hair never growing back. If your dog wasn’t acting happy it is because of how you reacted to how he looked. He does not know you think he is ugly (sad for you). He thinks feeling good over the loss of his uncomfortable coat is “wrong” and that you are upset with him for doing so. So please tell him how beautiful he is and start getting into the habit of brushing and combing him DAILY if you don’t want to relieve him of his thick coat again. I found this by googling pictures of shaved double-coated dogs. Wonderful article covering all the issues, I am sharing the link in a facebook dog group where I just had a discussion with people about this topic working on debunking the myth. Excellent Birgit. The dogs of the world will thank you! — allows for easy application of lotions and other emollients. Your points speak to why the article was written. THE comfort of the dog and the ease of which the human can assure that comfort in a way beneficial to both. Thanks for the great observations. We have a Japanese Spitz that we regularly shave. No adverse reactions and she loves it. Living in Australia, the heat here can sometimes hit 40C plus. Good for you for keeping her comfortable so everyone can enjoy life. Thank you! We have three Australian Shepherd/Bernese Mountain Mixes. Although their coats are beautiful (most of the time) once we shaved them – not severely, they are happy and look good- healthy & somewhat energized. They each have a younger, sweet look in their eyes. They are 9. The newest delimma has been over our rescued ACD. The banter back and forth about whether or not to shave her has been unending. Your article confirms our strong belief that she will feel better (which makes us feel better); and, look beautiful. Her hair grows faster than any dog we have ever had. I appreciate that you shared a photo of your beautiful dog. It is the first good photo I have seen that I can share with our groomer. Ella is scheduled for grooming today! I love it when people put how their dogs feel above how humans want them to look. Good for you!! Happy for your good dogs. Thank you so much for post! I really enjoyed reading it. My Mini aussie went in for a little trim two days and he came out with 1/2 inch of hair. I love his hair long because it’s beautiful. I was initially in shock, and I cried when I got home because I thought they potentially ruined his coat. Well he’s happier than ever with his short hair and bouncing around again. I was looking at how I felt about the way he “looked” instead of the way he feels now. I can totally see the difference. I feel more at ease that I didn’t make a HUGE mistake by taking him into the groomer. Although, I feel from now on, I will trim him myself. Although the groomer really should have been more specific about what he was going to do, you have been the recipient of a very, happy accident which has made your dog a happier being. So glad you were able to see that this was a gift to you both. Your article was great and what I needed to hear. I have seen Full coated OES in the summer just dragging around. Once they are shaved , they fly around and can’t get enough of life!! I always tell jessy how beautiful he is. When he gets his summer shave. And yes, he rolls around and dances like a puppy!! So did mine. I had 2 OESs that adored being “Naked”. Did you send the test to Dr. Jean Dodds at Hemopet in California? (http://www.hemopet.org/) There are many causes for hair depletion in dogs. Topical Flea and Tick toxins, heart-worm medication toxicity, over vaccination which can cause a serious breakdown of the immune system (earmarked by allopecia or mange for example), reactions to all the chemicals in the commercial dog foods posing as nutrition. The dog’s skin is his largest organ and it is where serious detoxing is done. Seems to me that is where I would like my vets attention to be. Thank you so much for this post! It really set my mind at ease. I have been constantly the same thing… Never shave a double-coated dog. Their hair won’t grow back correctly. Funnily enough, NONE of them have been able to show me an example. I’ve had my rough collie for three years now and he is miserable most of the year until winter comes. I’ve tried and tried to keep him groomed myself, but he hates it. He pulls away and fights through every grooming, making us both miserable and cranky. Finally I’d had enough and just left it go. Well that was a mistake I heartily regret. His hair on his belly, hind quarter and neck is so knotted, my wife and I had to cut baseball sized tufts of hair from his hips. I feel horrible about it now. Reading this article has settled it for me. Come late spring, when the weather warms, I’m going to have him shaved. Not down to the skin or anything, but like 1 to 1.5 inches of hair left. I’m convinced we’ll all be much happier. Good for you! He will be in heaven! Well written article. Just the information I was looking for. Thanks! I kept finding so many anti articles and couldn’t understand how it would not be beneficial to shave a dog down to a comfortable length when living in a hot climate like Texas. You will be tickled pink at how happy this makes your good dog! We had to shave our rescue dog. I have been crying because I am scared his coat is ruined forever. Will it grow back? Thank you for this article! I just dropped my Aussie at a new groomers and she gave me this long talk about how I should not shave her at all because it can cause thyroid issues. I was stumped…also I was trying to be open minded and told her to just do a comb shave…I drove straight to my vet (who I trust) and asked her what her thoughts were…she said the woman is crazy…the hair on my Aussie grows back every time…and she loves it when she’s shaved (always jumping around like a wild woman…). Good day! Good for you Heidi for doing your due diligence and keeping your gooed dog happy and healthy! Why ending on a failure is a TERRIBLE idea!